Dental erosion is an increasing side effect of modern diet. Acidic foods and drinks lead to acid erosion of the tooth enamel, leaving dentine exposed and the possibility of pain and sensitivity, and long term tooth damage. Dental care products are being specifically developed to provide extra protection against these effects. For these products, it is essential to demonstrate their effectiveness for both consumer marketing and regulatory purposes. Lucideon's client developed a toothpaste formulation designed to help with remineralization of the tooth enamel. Lucideon was asked to design a series of tests to show the extent of fluoride penetration from the client’s toothpaste product and compare it to competitor products. The client wanted to visualize and quantify the benefits of their formulation. Visualization of the fluoride penetration was achieved using Lucideon's expertise in Dynamic Secondary Ion Mass Spectrometry (DSIMS). Cross-sectional images for a range of commercial products were generated and compared. The images illustrated that the highest level of fluoride penetration was achieved using the client's toothpaste formula. Semi-quantitative depth profiles were also generated to show that the concentration of fluoride in teeth following treatment with our client's product was also higher. The degree of fluoride incorporation also correlated with the extent of re-hardening of enamel and the lack of enamel erosion and roughening, determined by white light interferometry (WLI). Our results provided an excellent scientific platform to support marketing campaigns for the product range. 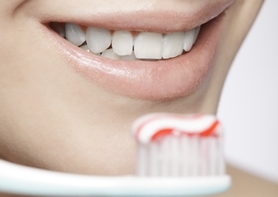 The consumer and dental surgeons could quickly see the benefits imparted by using the toothpaste. Monitoring the extent of fluoride incorporation also provided the important feedback the client needed for further product optimization.